The United States Military has been instrumental in shaping perceptions of the United States in Korea, and has played an outsized role in the development of the South Korean state. This relationship dates back to 1945 and the end of World War II, when the U.S. military Government directly ruled South Korea under General John Hodges until 1948. The partnership has been bound in blood since the outbreak of the Korean War in 1950. During that war, 36,516 Americans died pushing North Korean troops out of the South and up to the Yalu River border with China. The U.S. military helped build the foundations for the Republic of Korea and has had a physical presence in the country for almost all of its history. Underscoring the importance of the relationship, it was during the short period after U.S. forces left Korea in 1949 that North Korea invaded the ROK and started the Korean War. North Korea remains a threat to both South Korea and American interests in Pacific Asia. From 1953 to 2003, North Korea was responsible for 1,439 major provocations, as well as for the deaths of at least 90 U.S. and 390 ROK soldiers. There are currently about 28,500 U.S. troops in South Korea; however, the original Cold War logic that inspired Washington’s need to defend against communist encroachment has become more of a historical memory than a driving force. In addition, South Korea is no longer poor and authoritarian, but economically dynamic and legitimately democratic. South Korea’s democratic society is unable to repress latent anti-Americanism in the same way previous authoritarian Korean leaders could. U.S. leaders are losing patience with the idea of supporting rich allies while their own economic situation is still troubled, and resources are under more pressure following the Budget Control act of 2011. 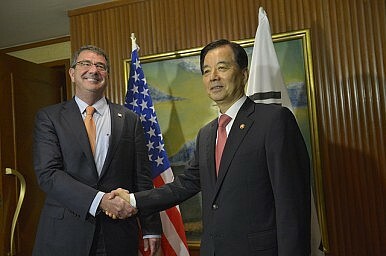 In another holdover from the start of the alliance, the United States still maintains wartime operational control of South Korean forces, a situation unique to the U.S.-ROK alliance. Furthermore, there is a large degree of uncertainty about whether the U.S. and the ROK can continue their alliance if Korea is unified, especially if the alliance cannot find new purposes beyond the Korean Peninsula. The defense secretary’s trip demonstrates how the U.S.-ROK alliance is caught between its past and its future. The Cold War calculus that justified risking U.S. lives to defend South Korea from the global communist threat is gone, but the principal antagonist remains just north of the 38th parallel with the same strategy of brinksmanship that it relied on throughout the Cold War. Now, however, that same antagonist has nuclear weapons. North Korea’s presence in East Asia is not purely a source of instability; it is an important part of the status quo that has maintained U.S. alliances in the region. It is an open secret that the U.S. security community is concerned about the rise of China and the potential for conflict. Similar sentiments can now be found in most East and South East Asian capitals. However, the United States and regional allies are increasingly depending on China for economic reasons. North Korea’s continuing threatening behavior provides a compelling reason to maintain the U.S. alliance structure, but absent the North Korean threat, U.S. and regional balancing against China will become more transparent. For the alliance to continue into the future, it must expand beyond old parameters. The ROK, with U.S. support, is rich enough to provide a credible deterrent to North Korean aggression and take on greater responsibilities within the alliance and the international system. South Korea is no longer a junior partner, and should strive for a more equal footing with its superpower ally. This includes paying its fair share of defense burdens and taking on operational control for its own forces. The United States should respect ROK desires for transparency in the alliance, especially with respect to taxpayer funds provided to U.S. Forces in Korea (USFK). History has shown that when the United States makes decisions without consulting the ROK, such as during the Nixon or Carter administrations, it breeds distrust and abandonment fears. Beyond the alliance structure itself, ROK’s new “Global Korea” paradigm is important for evolving the U.S.-ROK relationship beyond the Korean peninsula as the ROK seeks new ways to contribute to collective security through measures like anti-piracy and peacekeeping missions. This more global outlook will be key if Korea unifies; without it, it would be much harder to address Chinese concerns about the true intent in any continuing alliance. As Victor Cha has noted, to ensure the future of the alliance, the focus needs to be on its intrinsic value rather than its strategic value for specific contingencies. An alliance that lived up to that would be grounded in shared interests in stability and democracy that could be sustained even if the current core organizing principle disappears. The US-South Korea Military Cost-Sharing Agreement Has Expired. Now What? Trump’s cost-focused approach is taking its toll on the U.S.-South Korea alliance. South Korea and China Make Amends. What Now?3 Stages of Park Geun-hye's China DiplomacySouth Korea to America: Please Elect Hillary ClintonHow North Korea Helped Seal the Deal on THAADTHAAD Deployment: South Korea’s Alliance Dilemma?